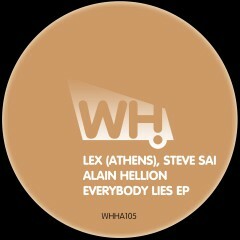 We are proud to welcome Lex (Athens) to the WH family. One of the key people of the Greek club scene, he runs the Quantized Music label and also the hottest underground parties of the capital called Move with some of the world’s finest DJ talents flying in as surprise DJs. He even used to run Radical Soundz, one of the most legendary vinyl shops in his hometown proving his full dedication to music. His super busy DJ-schedule takes him to places all over Greece and abroad but he still manages to make music for quality labels like I Records, Cuff, Street King and Erase Records to name a few. This is his excellent new 2-track EP in collaboration with Steve Sai (Bonzai Progressive / Suffused Music) and Alain Hellion. Hot one for the real tech house and deep house heads.